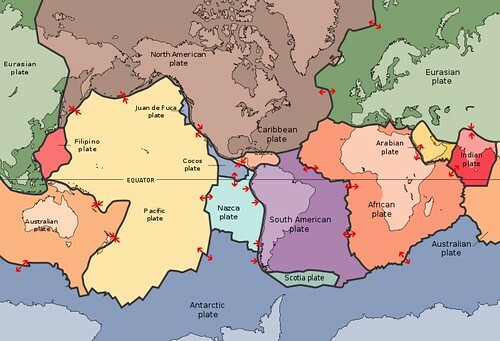 Plate tectonics describes the motions of the 15 to 20 large rigid and brittle tectonic plates into which the Earth's outermost layer (called the "lithosphere") is broken. It does a good job at explaining the distribution of most of Earth's earthquakes, mountains and other geological features, and a particularly good job at explaining features on the ocean floor. However, it is challenged to explain the details of the older rocks on the continents, and the occurrence of deformation an earthquakes off of plate boundaries. In the Pacific Northwest movement of three tectonic plates drive our earthquake hazard. The Pacific Plate is moving to the northwest at a speed of between 7 and 11 centimeters (cm) or ~3-4 inches a year. The North American plate is moving to the west-southwest at about 2.3 cm (~1 inch) per year driven by the spreading center that created the Atlantic Ocean, the Mid Atlantic Ridge. This may seem like small and slow motion but over geologic time scales these movements add up to hundreds and thousands of kilometers, and can reform parts of the surface of Earth. The small Juan De Fuca Plate, moving east-northeast at 4 cm (~1.6 inches) per year, was once part of a much larger oceanic plate called the Farallon Plate. The Farallon plate used to include what is now the Cocos Plate off Mexico and Central America and the Juan de Fuca Plate in our region from N. Vancouver Island to Cape Mendicino California and a large tract of sea floor real estate in between. But the central part of the old Farallon plate vanished beneath North America. It was subducted beneath California leaving the San Andreas fault system behind as the contact between the North America and Pacific plates. The Juan de Fuca Plate is still actively subducting beneath N. America. Its motion is not smooth, but rather sticky; strain builds up until the fault breaks and a few meters of Juan De Fuca slips under North America in a big earthquake. This action takes place along the interface between the plates from the Juan de Fuca Trench off shore down-dip until the fault is too weak to store up any elastic stress. The locked zone varies in width from a few tens of kilometers (km) along the Oregon coast to perhaps a hundred km or more off of Washington's Olympic Penninsula, and is about 1,000 km long. It takes a lot of slip (10s of meters) over a very large area to generate the M9 subduction zone earthquakes that rock our region ~ every 550 years on average. These plate motions are the primary source of strain in the lithosphere that lead to earthquakes in our region. In California, much of the strain generated by the grinding of the Pacific Plate against North America is taken up in earthquakes on the San Andreas Fault and related structures. But, the shearing action dosn't end there. The Sierra Nevada block is driven north-northwest into the Oregon Coastal Range. This block of crust is rotated west and pushed north into Washington state. British Columbia however is part of rigid North America and moves with it. 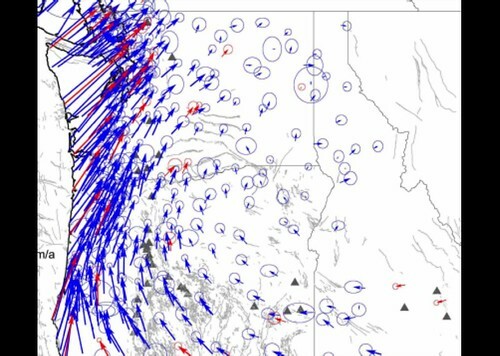 This results in the Puget Lowland being compressed and warped like an accordion with alternating uplifted and down warped terrain shortening the distance between Centralia, Washington, and the Canadia border. Dr. Ray Wells of the USGS developed a model to demonstrate this process and produced the cartoon animation located above the GPS Vector map. Shoveling off all the sedimentary deposits from the basement rocks underlying the Puget Lowland would certainly be one way to reveal this pattern. But that would involve way too much digging! Fortunately geophysics allows us an much easier way to uncover the basement--measure the gravity. This map of gravity residuals measured over the puget lowland reveals a pattern of deep, fault bounded basins (cool colors) and uplifts (warm colors). 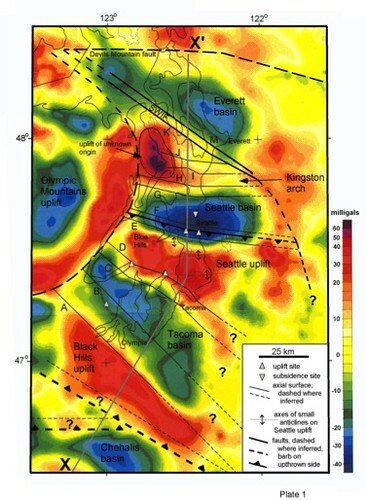 Notice the Seattle Fault Zone bounding the Seattle Basin to the south. The South Whidbey Island Fault and Darrington Devil's Mountain Fault bound the Everett Basin.